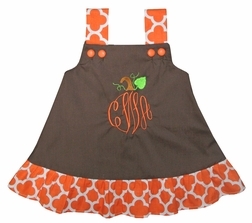 We just love our newest fall and Thanksgiving dress/outfit for little girls with a pumpkin made from her 3 initials! We start with solid brown fabric for the dress/top and make the shoulder straps and a ruffle from orange quatrefoil fabric. The shoulders fasten with two orange small covered buttons. 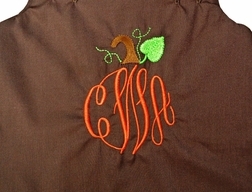 Your little one's initials form the big embroidered orange pumpkin with its brown stem and green leaf in the center of the chest. You may choose just the dress, a dress and quatrefoil bloomers or a 2 piece outfit. 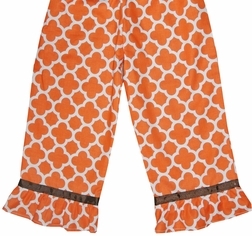 The capris and pants if chosen are made as shown using the quatrefoil and brown ribbon trim.